WordPress Cryptocurrency Widgets, Converter and Live Prices Tables Plugin provides a crypto converter which converts any crypto currency to usd or another crypto currency. Plugins also provides a functionality through which you can show recent prices for a specific currencies. Plugin also provides widget to show converter, recent prices table, and any crypto currency pries in different currencies. Plugins provides two basic feaures for Cryptocurrencies. – This will show Crypto converter and recent prices for choosen currency. – Admin can select which currencies will be shown in From dropdown field in converter. – plugin allows to set Time Difference for Recent prices table i.e recent prices by every minute, by hour and by day. – No . of Rows for Recent prices table i.e if you have set it to 12 and “Time Difference” is set to Hour then prices for last 12 hours will be shown. – You can choose which columns you want to show in Recent Prices table i.e Time. Opening Value, Closing Value, Lowest Value, Heighest Value, Volume From, Volume To, Changes. – Default Currency – you can set a default currency from admin side ie currency to which bitcoin will be converted. – Theme options for both converter and Recent Prices table i.e you can customise the theme of Recent Prices table and Converter from admin side. – Either you want to show prices table or not i.e if you just want to show Bitcoin converter. – Either you want to show converter or not i.e if you just want to show Recent Prices table. – This will show a Table forselected currency Prices in different currencies which are set on admin side. – Theme options for Bitcoin Prices table. 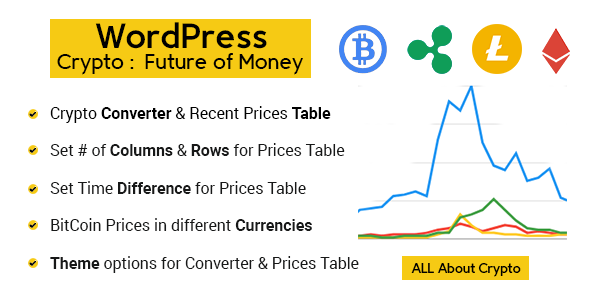 WordPress Cryptocurrency Widgets, Converter and Live Prices Tables also provide widget for Crypto Converter, Recent Prices, and Specific currency prices in diferent currencies. 1- Just Create a shortcode with your desired options mentioned above. 2- Open Widget area in wp-admin and select Crypto Currency Converter Widget from the available widgets. 3- Set Title, Select the shortcode which you want to show in widget and the save the widget. WordPress Cryptocurrency Widgets, Converter and Live Prices Tables provides shortcode for these two feature and you can create different shortcodes for different places. Even you can set different options for different shortcodes.